According to the Dessert Sun, a local Palm Springs newspaper, the Spa Resort Casino will no longer offer poker to its patrons, as it was announced yesterday that the nine-table poker room would be converted into a non-smoking slots area that will reopen in a couple of weeks. The closure will also cause layoffs of Spa Resort Casino staff. 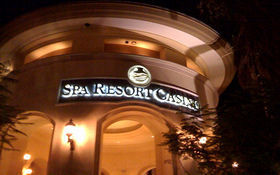 The Spa Resort Casino is located in Palm Springs and operated by the Agua Caliente Band of Cahuilla Indians who also own and operate other casinos in the area, including the larger Agua Caliente Casino Resort Spa located in Rancho Mirage –which recently opened a 16-table poker room. This entry was posted on Wednesday, December 1st, 2010 at 1:52 pm and is filed under Poker Industry News. You can follow any responses to this entry through the RSS 2.0 feed. You can leave a response, or trackback from your own site.